You know what they say - a change is as good as a holiday. Yup, I'm changing the bedroom. Again. I know some of you think I'm completely bonkers, but although I loved the soft black walls when I first painted them at the end of October in 2015, I came to realise pretty soon after, that I need colour and light in my life, so the black is going, going, gone! It had a good run of over 16 months (that's not bad for me! ), and now it's time for something a little lighter and brighter. And when I say a little, I actually mean a LOT. I debated this colour choice a fair bit. I decided to go much more neutral, much, much paler, much more grown up and dare I say sophisticated, but then I realised that my heart didn't want that at all. Maybe one day, but not this time, so saturated pink it is! 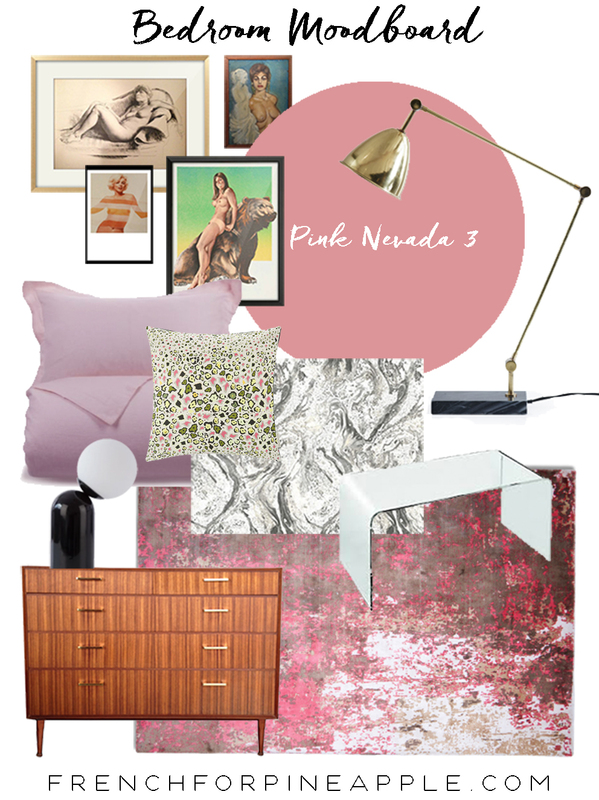 The pink I've chosen is called Pink Nevada 3 by Dulux, who I've teamed up with again for this exciting project. I did look at lots of pinks, as always the perfect colour doesn't present itself immediately, but I honed in on Pink Nevada 3 pretty quickly. Okay, I *might* have quite liked the name too. Unashamedly pink indeed, but with the perfect amount of dirtiness that makes it modern and grown-up. And you know I'm not afraid of strong colour, right? You may have already seen my wall to wall channel tufted headboard that I completed recently, with stunning linen from Earthed. It's been a big part of my decision to completely overhaul the bedroom, and inspired me to change almost everything in the room. I think we get used to seeing the same objects every day, and don't always consider whether we still like them, if they work in the room, and if they fit with the look you're going for. After I finally got rid of our old bed (yes! ), I realised that although I still love certain things (lamps, and bedside tables and rug to be specific), that they weren't really working for me anymore in the bedroom. I've already moved the existing Berber style rug into the living room, and it's renewed my love for it. The lamps will either be re-homed, or re-located - I haven't quite decided. The only thing that's staying is the chest of drawers, and maybe the mirror. Everything else is changing, and I can't wait for a fresh new look. It's not often I do a room makeover where virtually everything changes, so I have to say I'm pretty excited about this one! I'm going for a grown-up yet playful, boutique hotel feel. Much less boho, and more modern and glam. Aside from the paint colour and headboard, I want to keep it fairly minimal, with a new pendant fitting, acrylic bedside tables so they don't block the headboard, and simple, elegant, brass bedside lamps. I hope to be getting this room finished pretty quickly, and have some additional exciting sponsors on board too, so stay tuned, and look out for sneak peeks on my Instagram stories! Looking forward to see your progress. It's looking pretty good.